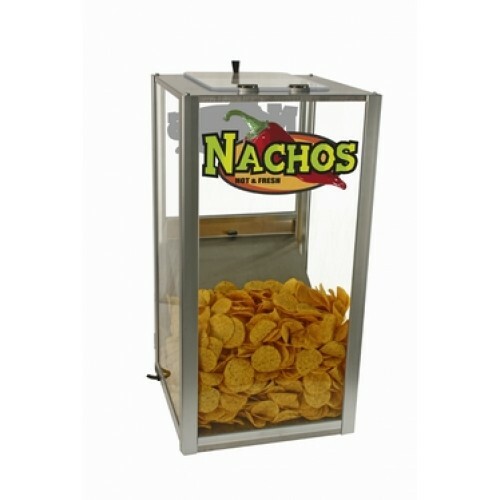 Paragon Popcorn Warmer | Nacho Chip Warmer | Peanut Warmer - This warmer and merchandiser is ideal for environments that have very high usage in a short period of time. 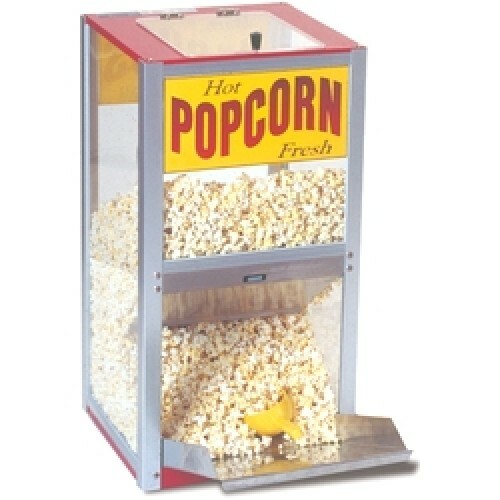 Each warmer has a 50 watt warming element in the base to keep pre-popped popcorn fresh and available for peak selling times. The clear lid allows light to shine into the holding compartment while the stainless deflection board prevents Popcorn from breakage during loading. Stainless steel warming deck has a heating element underneath to keep all of the product in the cabinet - not just the top - warm and fresh for hours. Easy to clean surfaces - just wipe with a damp cloth. Sturdy stainless steel and aluminum frame and tempered glass side panels. Perfect for popcorn, nacho chips or peanuts - graphics for all are included.